I have just put a load of nappies in the washing machine and I was reminded of a comment that someone said to me when I first started using cloth nappies on baby boy. “I haven’t got time to use reusable nappies” she said, rolling her eyes, “far too much washing involved”. At the time I nodded and said something along the lines of I hoped that I would be able to keep on top of it all. 9 months down the line we are still using them and I have realised that the ‘no time to use them’ comment was just plain wrong. I have decided therefore to try to dispel some of the myths surrounding reusable nappies. Over the course of the next few weeks I will try to give my opinion on why some of the wide held opinions on reusable nappies are outdated. Once you have a baby a vast majority of your time is taken up with changing either wet or poopy nappies. It is a fact! Babies can produce an unbelievable amount of poop. It doesn’t matter if they have already filled 3 nappies that day, they can still produce more. Therefore whether you are using disposable or reusable nappies you are still spending a significant amount of time changing nappies. In my opinion modern cloth nappies are just as quick to put on as a disposable nappy. Or in the case of baby boy, both types take just as long to put on once the wriggling, flipping over, crawling away, being brought back resulting in a tantrum is all over! His night nappies may take a tiny bit longer to put on but not a significant amount longer I have to say. I know that some people worry about the time it takes to wash and dry reusable nappies. Well I don’t stand at the sink hand washing them let me tell you and the days of boil washing are over. I use an amazing contraption called a washing machine! In all seriousness though the nappies just go into the washing machine with a cold rinse at the beginning, a wash and then an extra rinse at the end. I usually put them in over night so I can just put them on the line or the clothes maid (depending on the season and the weather) in the morning. I usually wash a load every other night, sometimes every 3 nights depending on how many nappies have been used. It really doesn’t take up much time at all. I promise! I do worry that people think that using cloth nappies will take too much time. It would be a real shame for people not to try them just for this reason. Modern cloth nappies are simple and with the excellent washing machines we have today they really are no extra work than a disposable. Do you use cloth nappies? Do you find them time consuming? « Advice – well meaning or interfering? I use cloth diapers and I love them. I don’t find it particularly difficult or time consuming. I love that I have NEVER had to clean up a blow out because the cloth contains all kinds of disasters. I also love that I am not putting a bunch of diapers into landfills. But my overall favorite part of cloth diapers is how stinking cute they are! They are soooo cute! I love how squishy baby boy looks in them. I have a bit of an addiction I have to admit. It’s a good job I can’t afford custom ones! New to cloth and I already love it. Compared to the amount of clothes I had to wash with blow outs, nappy bins that needed emptying, digging out packet of nappies, wipes, bags etc, cloth is a breeze! Dirty nappy, liner out, nappy in wash bin, new nappy on. Wash goes in, wash dried and hey presto my nappies are ready to go! No worry about running out and having to go to the shop at 11pm! And if he has a growth spurt.. Hey just use the next popper, not waste half a pack of wrong sized nappies! Bravo! 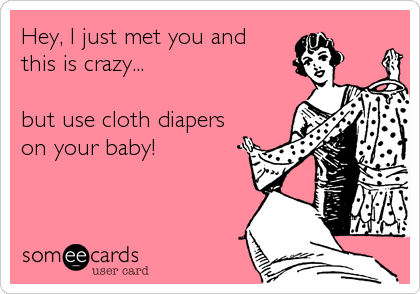 You have just described the many reasons I love cloth nappies! Glad you are getting on with them!